It's my birthday!!! I'm 31 today and this year (unlike last year) I am embracing my age. It took me a while to get over the whole "I'm not in my 20's anymore!" thing. Thirty is the new 21 anyway, so I guess that really makes me about 22... right? It's always interesting to see what my family gets me. My interests aren't what you might consider "normal" for a youthful spirit such as myself. No jewelry, clothing, or gadgets for me. My sister Glenda usually gives me the best gifts. The best part of her gifts is that it is usually something she finds around her ranch in an old building. This year was no exception. A brand new energy efficient washing machine!! What a nice sister she is. She also gave me butter churn that screws onto a glass jar. The best part... it works perfectly! We plugged it in and started washing. The rubber rollers are even still good. After four loads I had to stop because my clothes line was full. We are going to save so much water using this machine. I am so fascinated by this. I really felt like I was back in time as I was running clothes through the wringer. I will have to do a video of how I use it. The downside is that I have a HUGE pile of clothes all dry at about the same time that need to be put away. I guess a pile of clean is better than a pile of dirty. That is so cool! I would love to see how it works. What a neat gift. 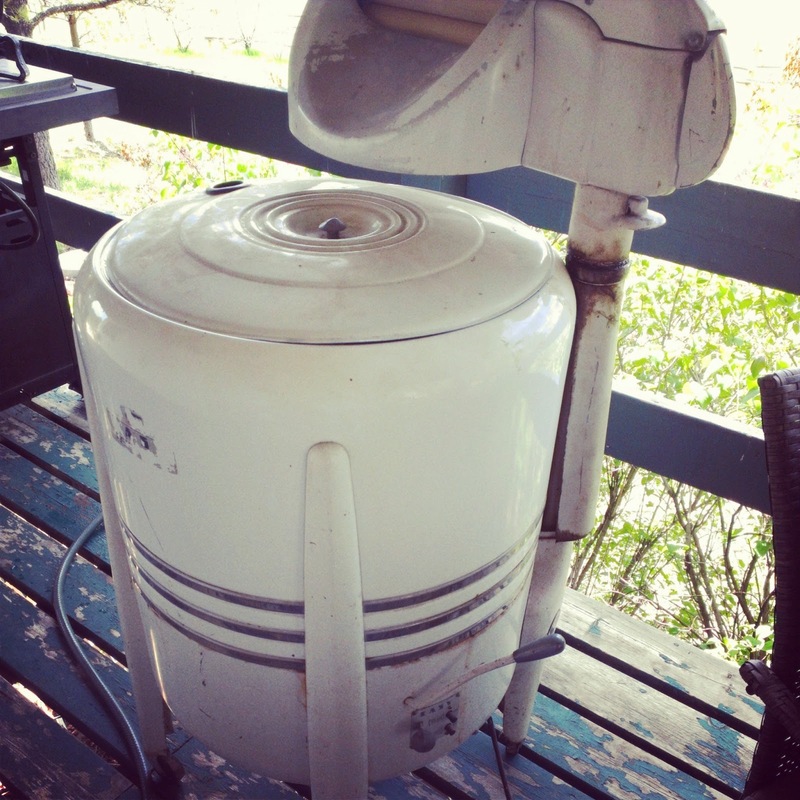 My granny used one of these when I was girl. It would be interesting to see a video of this. What a neat wringer washer. Your right tho about pile of clean clothes, lots to fold, hang and put away, LOL. Enjoy your wash days. I do remember how wringer washer! Was renting a flat up in Darwin way back when I was in my early to mid twenties. They had one of these and I just HATED it as everytime I tried to wind my sheets through they would start winding around the top part and hitting the lever to stop it wouldn't work so by the time I did get it to stop I had one big mess and would take me ages to unwind it as it was wound around so tight. And you had the clothes you déjas caught in the wringer? or ruined a couple of shirts? It would be interesting to see a video of this. So excited for you and glad to see another wringer washer user! 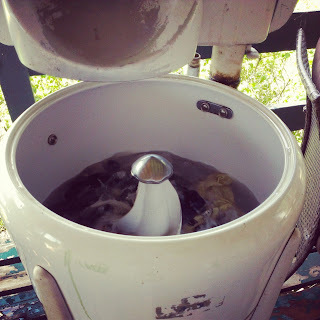 I've been washing with a Maytag wringer washer for over twenty years. They are great. I'm kind of jealous of your machine's cool spiral agitator. Looks like it is an Easy brand machine. You're right about the water savings. I think of these as the original high efficiency machine. Happy Birthday!